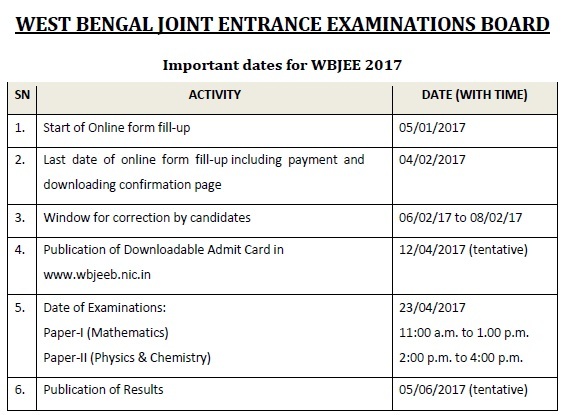 If you are looking for information on WBJEE Admit card 2017 and Exam date, test scheme etc. then this page is for you. 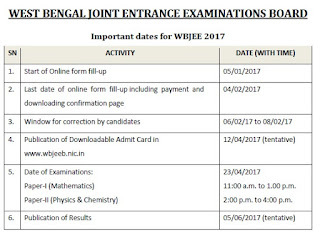 West Bangal Joint Entrance Examination (WBJEE) is an examination which is organized by WBJEEB for admission admission to various institutions in West Bengal imparting education in medical, engineering and technological courses. It is an objective type examination conducted through offline (pen & paper) mode. For admission in academic session 2017–18, West Bangal Joint Entrance Examination Board (WBJEEB) decided to held Common Entrance Examination for admission to UG courses in Engineering & Technology, Pharmacy and Architecture Courses in Universities, Government Colleges and Self Financed Institutes in the State. The test is on 23 April 2017 (Sunday). Paper-I (Mathematics): 11:00 a.m. to 1.00 p.m.
Paper-II (Physics & Chemistry): 2:00 p.m. to 4:00 p.m. The admit card had been released online from 12 April 2017. You have to visit the below link and enter application number and password to get it. Mathematics, Physics & Chemistry are the 3 subjects from which MCQ type questions are to be asked in the examination. There will be 2 papers. One of Mathematics and other of Physics & Chemistry. Paper 1 Mathematics will have 75 questions carrying 100 marks. Paper 2 Physics & Chemistry is having 40 questions each carrying 50 marks each. WBJEE admit card should be produced to enter the examination hall, during counseling, duing admission and registration with the university.